As a LUEX Supplier you now have a very transparent and convenient console at hand that gives you a full overview of all business done via LUEX. It’s called Supplier Central and is a great addition to your partnership with LUEX. Supplier Central has plenty of benefits and not a single disadvantage as opposed to prior processes. Here’s a list of all the good things you will find in Supplier Central. You can go to Supplier Central at any time 24/7 and find what bookings LUEX has taken, and how much money LUEX owes you. LUEX will send you a reminder to request payout as soon as you will become eligible for a payout of 1000 EUR or equivalent in other currency. 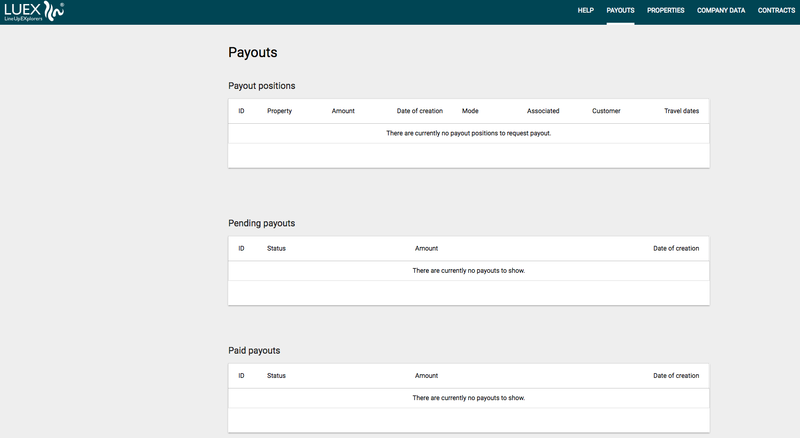 You can request a payout for the taken bookings at any time. You can choose to do it as soon as LUEX customer makes the payment, or wait until a larger sum is accumulated - it is totally up to you. You don’t need to send us any invoices to be paid for the bookings that LUEX has taken for you. Just request payout on Supplier Central and LUEX will make the payment. Much easier! You can receive money much much faster when choosing Paysera payout method. It’s also completely free of charge. All calculations are done automatically based on the contract agreed between you and LUEX therefore the risk for error is reduced to the minimum. LUEX is also very transparent about prices in the whole booking process so you know what you will be getting all along the way. You can enter and update information about preferred payout method such as bank transfer or Paysera transfer, and maintain your account details. This helps LUEX and you ensure smoother payments, reduce errors and reduce costs. We've partnered with a 3rd party tool for a smooth, secure and legally recognised electronic document signing process. LUEX is determined to improve Supplier Central to suit your needs. Supplier Central makes all processes between you and LUEX much more efficient which saves time for everyone and makes experience better. Efficient partnership means it is in LUEX's interest to do more business with you.